This post was too long coming but I was reading the alternate read for July’s Vaginal Fantasy book club while I was on vacation and my vacation brain lasted a little longer than I anticipated. My apologies, y’all! In honor of the Supreme Court’s decisions for DOMA and Prop 8, as well as to celebrate Pride month (a little late), Vaginal Fantasy delved into queer fantasy romance! This month’s main read was Tipping The Velvet by Sarah Waters and oh. muh. gawd. My friend, Sara, and I cannot stop gushing about how beautifully written this book is. While Tipping The Velvet does not fit into what I normally would associate with the genres of Vaginal Fantasy (no sci-fi, steampunk, fantasy, paranormal anything) the Victorian sensibilities certainly should appeal to the steampunk lovers out there. Speaking as an actor, the descriptions of the theatres in Part 1 of this book filled my brain to the brim. The smells and sights invoked downright transcendental happy feelings in me. Nan’s journey from an “oyster girl” who discovers her identity only to have her entire world crash down around her is heartbreaking, shocking, and, eventually, heartwarming. When she meets Kitty, she is an unremarkable self-described “fishmonger” and destined to stay that way. Her crush on Kitty, a woman who works the vaudeville circuit performing as a man, sends her life spiraling into self-discovery. She leaves her tiny town for the big city of London, is betrayed by her closest friends, abandons her family, and sets out on a journey of unexpected turns, extreme good fortune and soul crushing bad fortune. This book might be a “lesbian journey” but make no mistake – this is a book for anyone who has ever loved, lost, discovered, journeyed, and triumphed over mediocrity in even the smallest of ways. 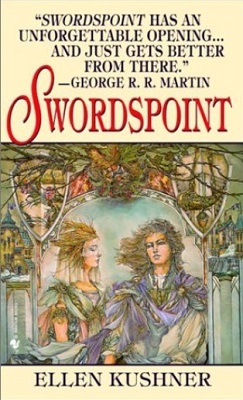 I wish I could say that Swordspoint by Ellen Kushner were even slightly as interesting. For the first time in a few months for me, the alt read was decidedly less interesting than the main read. In fact, I think it might be the first Vaginal Fantasy read I’ve given a 1-star review to on GoodReads. I hated this book. None of the characters had any redeeming qualities to me. It was about expert swordsman and the sword fights were boring, if they happened at all. I just didn’t get it. It’s a book more about politics and people too cowardly to fight their own fights and it was all just excessively vapid. Since I didn’t like the characters, I cared even less about the political climate and machinations. I read it. It was a snooze-fest. I agree on both accounts only I had the pleasure of going from the lack luster alt-read to the AMAZING main read. I’m seriously considering purchasing Tipping the Velvet because it was so wonderful and heartbreaking, definitely a visceral experience which seems to be hard to come by these days. I was so incredibly relieved to not be the only one. Not only was I not the only one but to be part of the majority on it, too. I wanted to like that book so hard, even knowing you didn’t care for it.